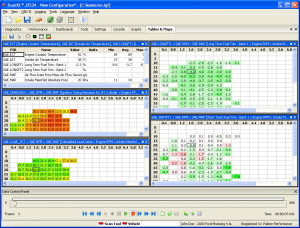 ScanXL is a professional OBD II software for Windows based PCs, developed by Palmer Performance Engineering. With OBD II interface, it is capable of a full range of generic diagnostics for all cars build in 1996 and later. Engine diagnostics is not only the thing that ScanXL can do, but it can also access to ABS, Airbag modules and other proprietary systems. Generic OBD – As a basic feature, you can read and clear trouble codes, including pending codes. It supports thousands of DTC’s definitions. Freeze frame data shows many PIDs at the moment ECU stored the code. And test result of I/M monitor status is for annual or biannual state inspection. Virtual dashboard – One of advantages of using PC for diagnosis is that you can use a large PC’s screen as a display of a scan tool. ScanXL has highly configurable cool gauges. Pre-existing template are loaded and ready to be used. The gauges can be moved, resized, and placed in anywhere you want. It is your own virtual dashboard. The gauges can be set up to report the minimum, maximum, and average values of the parameter being monitored. There are not only gauges, but also graphs, maps, and tables can be added to your virtual dashboard. ScanXL currently supports over 220 generic OBD-II parameters. 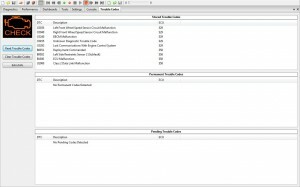 Data logging – Another advantage of using PCs for on board diagnostics is that you can use a computer memory as a huge storage of data log files. ScanXL currently supports over 220 generic OBD2 parameters. You can record and save log files and then playback later to analyze them. The playback speed can be adjusted slower or faster than real speed. Log files can be exported in .CSV format to be reviewed easily in other programs like Excel. Vehicle manager – Vehicle manager allows you to keep multiple vehicles’ information separately. ScanXL automatically keeps VIN (if available), date and time of the last diagnosis you perform. It is a very useful feature for repair shop owners. Manufacturer enhanced diagnostics – Most small handheld scan tools can’t access to ABS, Airbag, or other proprietary systems. But ScanXL with enhanced diagnostics add-on package can access to those systems. As of 2012, the add-on packages are available for Ford Lincoln Mercury, GM, and Mazda vehicles model years from 1996 to 2009. The professional OBD II software with OBD II interface is the scan tool equivalent to expensive dealer scan tools, but it costs thousands dollar less. You can download this professional OBD II software for free. However, you will not be able to use all program features without a license code. And for ABS and Airbag diagnostics, you also need to purchase manufacturer enhanced diagnostics add-ons.